I work with a guy who enjoys a ‘big’ background in consulting. I often see him munching on a chocolate bar. We laugh about it. The Consultant’s Bar! High energy. High empathy. Consultants often work on multiple projects. They need energy and focus as well as a knack of transposing themselves into different business environments and cultures. Skilled consultants hit the ground running and understand what they need to do and who they need to consult with. 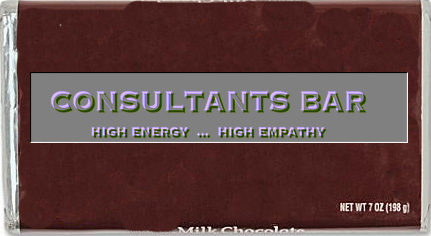 Like a researcher or investigative journalist, consultants go to the right people. These people are sometimes called Subject Matter Experts (SME’s) who are skilled in their particular fields. Those fields can be as different as engineering is to fashion design. As science is to fast food. As recruitment is to recreation. A consultant must first know who to go to. They must establish rapport as quickly as possible. This takes preparation, empathy and listening skills. Dr Samuel Johnson said “What doth please thee mightily, do strike out.” Forget pre-conceptions and gut feelings.